Moderate moisture to somewhat dry. Deciduous and mixed woodlands with thin or open canopies, forest edges. Partial sun to light shade. 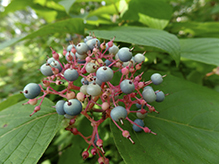 This is an erect, perennial shrub that rises from a shallow, branching, woody root system. It usually appears as a single stem that may be somewhat tree-like with a dense crown near the top. Sometimes it appears as as several widely-spaced stems, occasionally as a small thicket. The central and side roots have buds which may sprout and form above-ground stems (suckers). A stem can be 3′ to 16′ tall and up to 2″ in diameter at maturity, but is usually no more than 13′ in height. First-year twigs are hairy and light green or yellowish-green shaded, mottled, or streaked with dark purple. Second-year twigs are brown to reddish or purplish-black and hairless or almost hairless. They have scattered, raised, corky pores (lenticels) with purple bases. The twigs do not turn red in the winter. The pith is solid and white, lighter than the surrounding wood. The leaf scars are narrow, U-shaped, and slightly raised. Each leaf scar has three bundle scars and is connected by a thin line to the leaf scar on the opposite side of the twig. The terminal bud is egg-shaped and is covered by two sharply pointed, abutting but not overlapping scales. The scales have whitish tips, appearing frosted. Lateral buds are similar but smaller. The bark is gray or greenish-gray and rough. 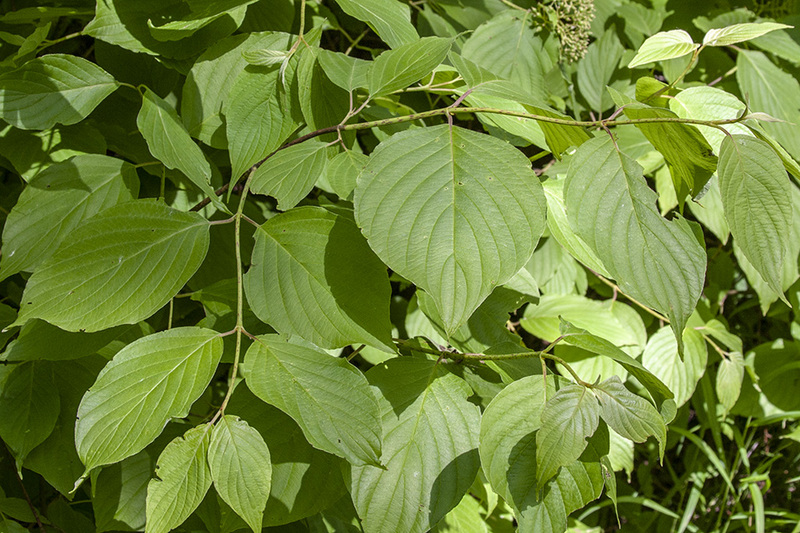 The leaves are opposite, deciduous, and evenly distributed along the branch. The leaf stalk is hairy and ⅜″ to ¾″ long. The leaf blade is broadly egg-shaped, broadly elliptical, or nearly circular, 3″ to 6″ long, and 2″ to 4″ wide. It is rounded or nearly squared off at the base and tapered to a short, sharp point at the tip with concave sides along the tip. On each side of the midrib there are 7 or 8 but as few as 6 or as many as 9 conspicuous veins that curve upward toward the tip of the leaf. The upper surface is dark green and sparsely to moderately covered with short, stiff, appressed hairs. The lower surface is pale green and densely covered with soft, woolly, gray hairs, at least in the angles (axils) of the main veins. The margins are untoothed. The inflorescence is a dense, flat-topped to shallowly convex, branched, ¾″to 2¾″ in diameter, ⅜″ to 1½″ tall cluster (cyme) of 30 to 150 flowers at the ends of the branches. The flowers are on hairy, 1 ⁄32″ to 3 ⁄16″ long stalks (pedicels). The flowers appear from early June to late July. Each flower has four sepals, four petals, four stamens, and a well-developed style. The sepals are fused for most of their length and separated at the tip into four minute teeth. The petals are creamy white, narrowly oblong lance-shaped, and ⅛″ to 3 ⁄16″ long. The stamens are longer than the petals. The fruit is a berry-like, 3 ⁄16″ to 5⁄16″ in diameter drupe with one seed. It is green initially, turning pale blue or whitish as it matures. It matures in early mid-August to late September. The pedicels persist, remaining on the plant in winter. See the Dogwood Filter for help in identifying this and other dogwoods. 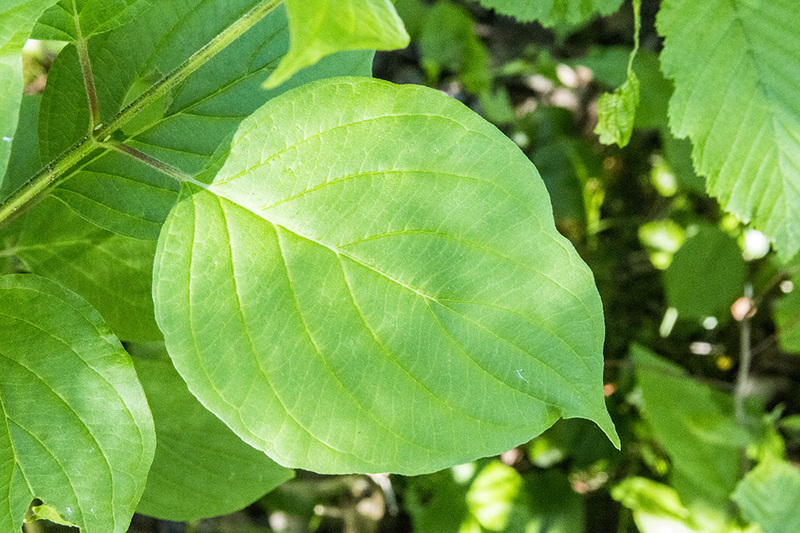 No other dogwood has leaves more than 4⅓" long or with more than 6 pairs of parallel veins, or purple-streaked first-year twigs.